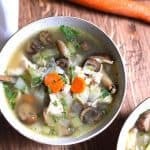 Detox Chicken Vegetable Soup is full of lean chicken breast, healthy vegetables, and a small amount of barley. Onion, garlic, leeks, celery, carrots, cabbage, and mushrooms are rich in antioxidants, fiber, vitamins and minerals. Perfect for detoxing after days of over-indulging! We just returned from five days in Napa Valley with some great friends of ours. We had a fabulous time, and while we spent a day hiking the Muir Woods and another day biking the Napa Valley Vine Trail, we spent even more time drinking wine. There was also Pasta Bolognese, Sausage Rigatoni, Margherita Pizza, Deep Fried French Toast, and Monster Burritos (among other things). Vacation and over-indulging are one in the same for Mike and I, and while I was a couple pounds down BEFORE our Napa trip, I’m staying clear of the scale for a few days to ummmm…. level out. More lean meals, less of this, this, and this! To boost our immunities after being out of town. For a comforting home cooked meal. To get back to lean eating after over-indulging. 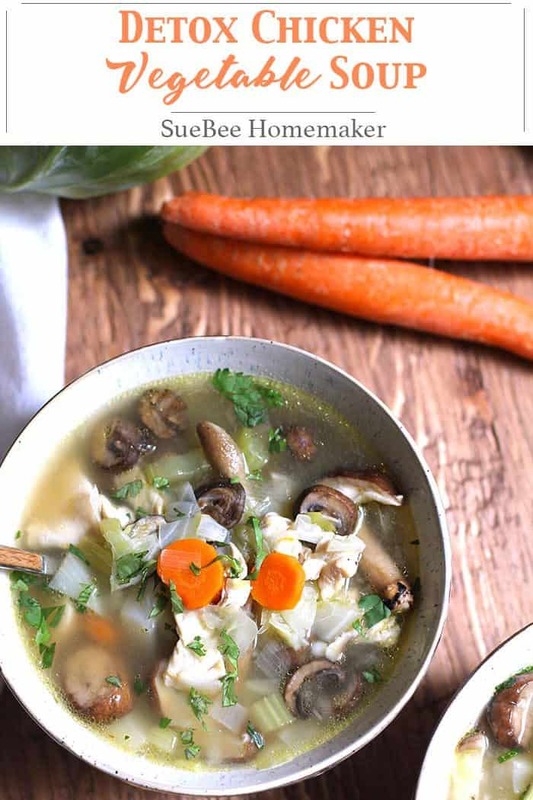 I considered making the dreaded “cabbage soup” (just google it) that is popular for detoxing. But I have a “problem” with all that cabbage and all those tomatoes. It usually makes me feel sick, and I’m unable to eat more than one serving. This recipe makes about 6-7 generous bowls, and since it is very lean, you will need a large bowl to fill up. Cut the chicken in chunks, and season before sautéing. After it is cooled, shred the chunks into smaller pieces. Soak the leeks in water to clean. This veggie hides dirt inside the stem. The barley will need at least 30 minutes to soften and plump. Lightly season the veggies as you add them. I like to season in layers. 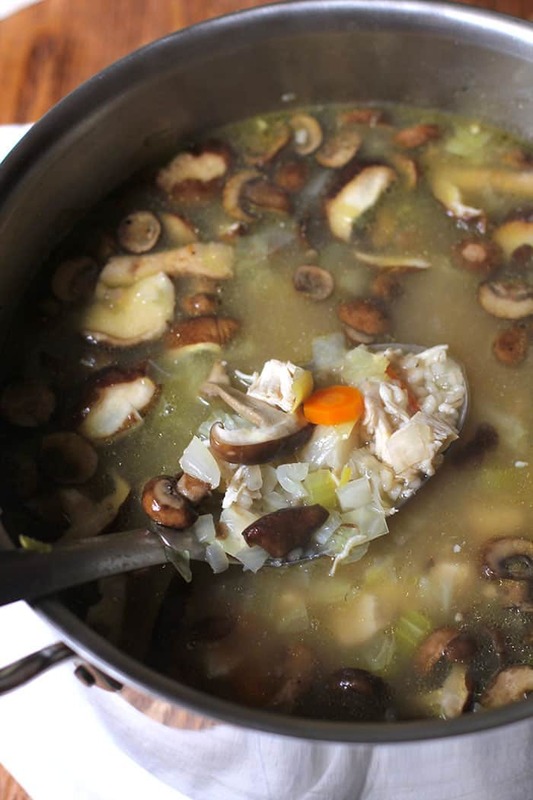 There are two types of mushrooms in this soup. But you could use any you like. The bay leaves will give the soup a fuller flavor. Don’t skip them. This soup is very adaptable. You can add or subtract veggies and quantities. With the holidays on the way, I’m going to need to eat this soup often. The good news is that it’s really tasty. The seasonings are right on the money – not too much and not too little. Bland soups are the worst, and this is not. 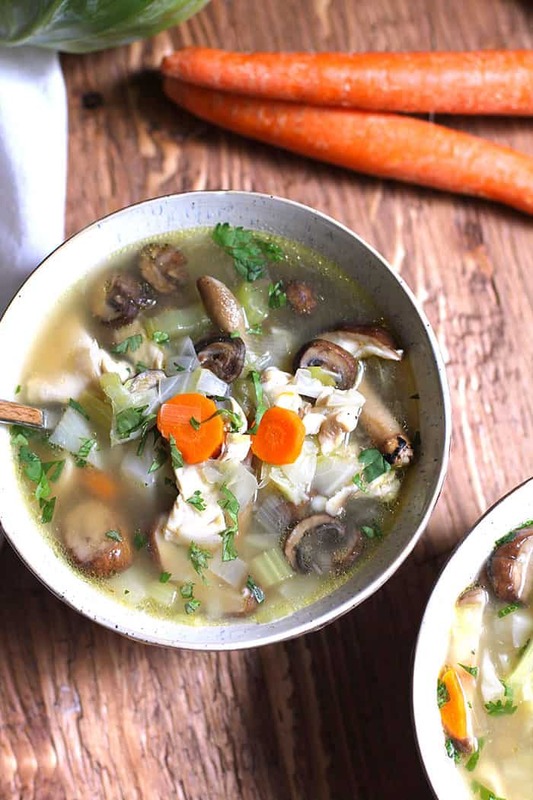 I don’t know about you, but I tend to need a detox soup every few months. We are huge foodies (obviously! ), and so when we go out-of-town, we try IT ALL. Btw, the deep fried french toast (YIKES!) in Napa was THE BOMB. Seriously drool-worthy. I wonder how many calories it had in it. Shhhhh. Time to D E T O X! 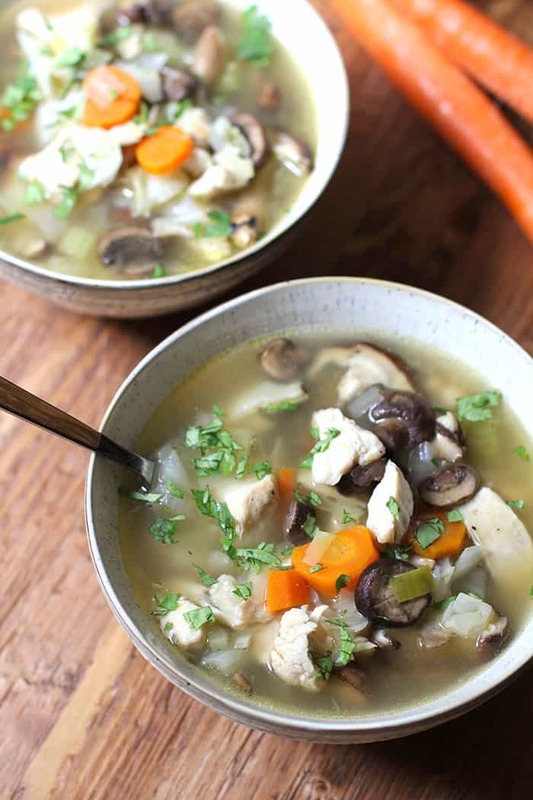 Detox Chicken Vegetable Soup is full of lean chicken breast, healthy vegetables, and a small amount of barley. Perfect for detoxing after days of over-indulging! Season the chicken with salt, pepper, garlic powder, onion powder, and red pepper flakes. Heat a large stock pan to medium heat and add one tablespoon of olive oil and then the chunks of chicken breasts. Cook for approximately 15-20 minutes, or until chicken is browned and just barely cooked through. Remove from pan and set aside on a plate. Rinse out pan and place back on stove with another tablespoon of olive oil. Then add onion, leeks, carrots, and celery. Season with salt and pepper, and sauté for 6-7 minutes or until veggies are softened. Add garlic and mushrooms to pan, and stir for another 3-4 minutes. Add chicken broth and heat until soup reaches a slow simmer. Add cabbage, bay leaves, and pearl barley. Cook for about 30 minutes, or until barley is done. Shred the chicken chunks, and add them back to the soup. Simmer on low for another 10 minutes. To serve, top with cilantro or parsley. The bay leaves will give the soup a fuller flavor. Don't skip them. I just made this tonight and it tasted amazing!! Thanks so much for posting this!! Very timely! The soup was awesome, but the scale is still up a few pounds. More soup please!